Matt Bevin says he was trying to address the "unintended consequences" of shutting schools when he made the comment. Kentucky Gov. Matt Bevin apologized on Sunday to people who he said were hurt by his "guarantee" that children were abused after a massive teacher walkout shut schools on Friday. In a video posted on his YouTube page, Bevin, a Republican, said he had been trying to address the "unintended consequences" of closing schools when he told reporters on Friday that "somewhere in Kentucky today, a child was sexually assaulted that was left at home because there was nobody there to watch them." "I guarantee you somewhere today, a child was physically harmed or ingested poison because they were home alone because a single parent didn't have any money to take care of them," Bevin added. The comments led to a resolution from the state's Republican-led House of Representatives condemning Bevin. "While this body may not agree with all that the teachers asserted, it is without question that the right to freedom of speech, the right to peaceably assemble and the right to petition the government for a redress of grievances are the backbone of our democracy," the resolution said. At least 44 school districts across Kentucky closed on Friday after thousands of teachers called in sick to attend a rally at the state capital, NBC affiliate WAVE of Louisville reported. They asked lawmakers to override Bevin's veto of two bills that would have increased public education funding. The House and the Senate did just that — and Bevin lit into the protesting teachers. On Sunday, Bevin said his comments had had "unintended consequences." "For those of you who understood what I was saying, thank you," he said. "But clearly, a tremendous number of people did not fully appreciate what it was I was communicating." "I apologize for those who were hurt by the things that were said," he added. 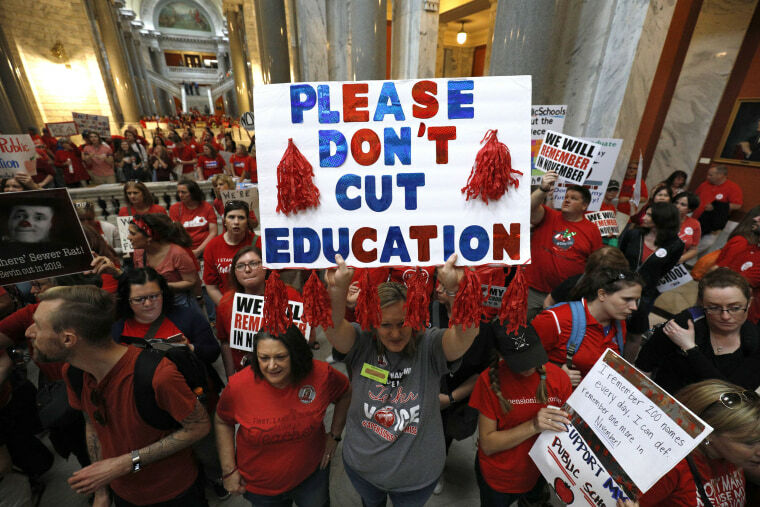 The protests in Kentucky come after a nine-day walkout in West Virginia led to a 5 percent raise — and as educators in Oklahoma, Arizona and New Jersey also demanded increases in school funding and wages.